A male locker room must consist of a few essential pieces. First, a dozen shirts to be able to adapt to all situations. We begin obviously with a basic, white shirt. Classic but still effective, the white shirt is a must-have. Is it really necessary to explain why? A white shirt is by definition timeless. Neutral, it suits all kinds of outfits and blends with all colors. Its classicism can be raised by associating it with other colored pieces and less strict. 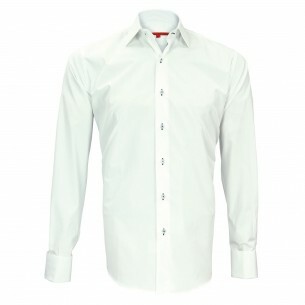 Moreover, the white shirt is always elegant, whether wearing it on jeans or in a suit. 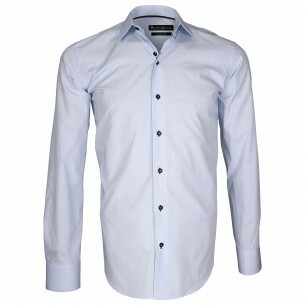 Also in the classics department, we will add a blue shirt and a pale pink shirt. Models that, just like the white shirt, will match easily. Depending on your morphology and usage, you are free to choose between models of straight or curved liners. If you are a bit overweight opt ​​for a straight cut and if you are svelte, opt for the slim fit, plus fashion. It is also necessary to have in his cloakroom at least a musketeer shirt that will be worn on dressed occasions, and that will embellish cufflinks. Two pairs of cufflinks, one classic and the other fancy, you will need. But it is the very type of accessory that we take pleasure in collecting and as the "jewelry" masculine are quite rare, we will take pleasure in offering some nice pairs of cufflinks. Also, do not hesitate can collect! Another accessory that goes with the shirt, the tie. Again, depending on how often you wear the tie, you can multiply your collection. If you make it a restricted use, two or three ties will suffice. They will be chosen from silk, neither too broad nor too narrow, so that they will not go out of fashion, and we will opt for a classic, united model, and a more fanciful model, of oxford tie type. If you are a fashion lover and you like to stand out, the bow tie can be a card to play. Yet one can not speak about it as an essential piece, unless one regularly passes a tuxedo. In this case, the black bow tie becomes necessary. Let's get out of the shelves of accessories to get back to basics. If the short-sleeved shirt is not essential, the polo is. Indeed, long time ago polo became a classic piece of the men's locker room. We recommend that you have a few short sleeve polo shirts, the most worn, and long-sleeved polo shirts. 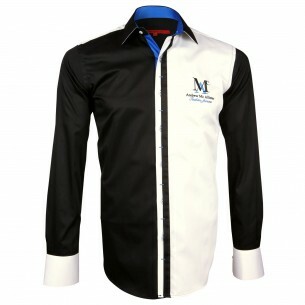 At ChemiseWeb.com, we offer, in addition to a large selection of shirts, a wide choice of polo shirts. From the most classic, plain polo shirts in piqué cotton to the most fashionable, shirt-collar polo shirts, bi-colored polo shirts and more. If the polo is originally a sportwear accessory, it is now easily worn under a jacket. So a few classic long-sleeved polo shirts can be a perfect mid-season accessory that can be worn on jeans or in a suit. When it comes to short-sleeved polo shirts, you can get more fancy! Note that the polo just like the shirt will also be worn under a sweater. And since we are talking about sweaters, here is also an essential accessory. There must be some in his wardrobe. We start with the classic v-neck sweaters and round neck sweater - the models best suited to wearing shirts and polo shirts - that will be complemented by one or two turtlenecks for the winter frost. Zippered or buttoned pullovers, like waistcoats, can also be very practical and comfortable to wear. We will take care to have sweaters adapted to all seasons and temperature. Wool sweaters or cashmere sweaters for winter and cotton sweaters for the summer. If you are adapting streetwear style, the sweatshirt is not to be neglected, but it can not be considered as an essential in contrast to wool sweaters for autumn and winter and cotton for spring And summer. It will preferably be chosen as single, single or hooded. If you are not a fan of sweaters, you may prefer to wear a jacket. It is a rather dressy and elegant option provided you have several models of jackets adapted to all seasons. But again, even if owning a few jackets on its hangers is never a bad idea, one can not qualify the essential accessory jacket. The costume, on the contrary, can be, on the condition, of course, that you have the use of it. If you do spend a costume only very occasionally, only one should do the trick. It will then be chosen classic, good cut, plain because easier to match and dark color for the same reason. If on the other hand you have to wear a costume every day to go to work, then you will have to invest in several models, if only to have a spare when it is necessary to bring one to the pressing. The costumes of different colors, gray, black, brown and navy blue, are the classics of the genre, in order to be able to vary his outfits and consequently his style and look. It will not be forgotten that the costume is worn with city shoes. These can also be and obviously regarded as essential to your cloakroom. There are two good pairs of leather shoes, preferably black and brown. They will be worn on matching socks and fine cotton socks. And since we are talking about costume, let us add that it is now completely free to wear it with or without tie, but that with or without, it will be worn on a shirt collar Italian or small collar Collar but not on a shirt with soft collar of American shirt type. Other essential accessory to all male wardrobes, the belt. Indeed, wearing a suit, jeans or trousers of canvas or chino, the wearing of the belt is necessary. Not so much for its usefulness as for the style. You will therefore need, at least, two belts in your locker, preferably black and brown leather, so that you can easily match your outfit and especially your shoes. Who says belt said pants and here we are in front of several essentials: jeans obviously, and we can multiply envy the cuts and colors, chinos or pants of cloths, pleasant to wear in hot weather and without forgetting Some shorts or bermudas for the holidays. If you add to the above-mentioned clothes accessories that are mostly dedicated to winter outfits, namely gloves, scarves and headwear, you will have toured the essentials of the men's wardrobe. As for the gloves, as much to rely on the elegance and the comfort by putting its sights on a pair of leather gloves, black or brown again, and lined in wool or cashmere.